Welcome to the Siege of Petersburg Online! Please consider signing up for The Siege of Petersburg Online’s RSS Feed, which will keep you updated on our progress over the years. I say years because the amount of data planned for this site is massive. Check out the Siege of Petersburg Resources link at the top of the page for just a glimpse of what is in store here. Battle Summaries: Are you interested in a specific battle from the Siege of Petersburg? Look no further than my battle summary pages. Each contains a brief description of the battle and gathers together a list of ALL of the posts on this entire site which refer to that specific battle. Units Pages: Explore every regiment, battalion, and battery which participated in the Siege of Petersburg. These unit pages give you information on a unit, its commanders, how it fit into the army organization over the Nine Offensives, how many men the unit had at a given time, and the types of weapons the unit was using. Perhaps most importantly, a list of ALL of the posts on this site concerning a given unit appear at the bottom of that unit’s page. There are a few non-line units and the Confederate Second Corps still to post. Otherwise all units present at the Siege from June-August 1864 are present and accounted for. Official Records Reports: Every official report from the Siege of Petersburg from the Official Records of the Union and Confederate Armies in the War of the Rebellion, well over 1,000 reports, are included in this section. Volume XL covers the period from June 12-July 31, 1864, including the Second Battle of Petersburg and the Crater. Volume XLII covers the period from August 1-December 31, 1864, from the Fourth through the Seventh Offensives. Battles include Globe Tavern, Second Ream’s Station, Fort Harrison and New Market Heights, Peebles Farm, the Darbytown Road battles, Boydton Plank Road, and Warren’s Stony Creek Raid. Volume XLVI covers the action from January 1-April 9, 1865. Battles include Hatcher’s Run, Dinwiddie Court House, Five Forks, the Breakthrough, Fort Gregg, and the Appomattox Campaign. Maps: I’ve been collecting all of the public domain maps I can find about the Siege of Petersburg. Maps are grouped by Offensive and then by battle. Sources include the Ed Bearss NPS Troop Movement Maps, Official Records, the Civil War Trust, Battles and Leaders, and old regimental histories from prior to 1923. Siege of Petersburg Newspaper Articles: I’m amassing new newspaper articles both during and after the war which describe events at the Siege of Petersburg. The June 1864 section is particularly well represented, but the 150+ articles you see there are just the visible tip of the iceberg. I have many, many more waiting to be transcribed and posted. If you are interested in helping me transcribe newspaper articles, Contact me. Southern Historical Society Papers: I’ve only just scratched the surface here too, but the goal is to find, transcribe, and annotate every single article on the Siege of Petersburg from the 52-volume Southern Historical Society Papers. 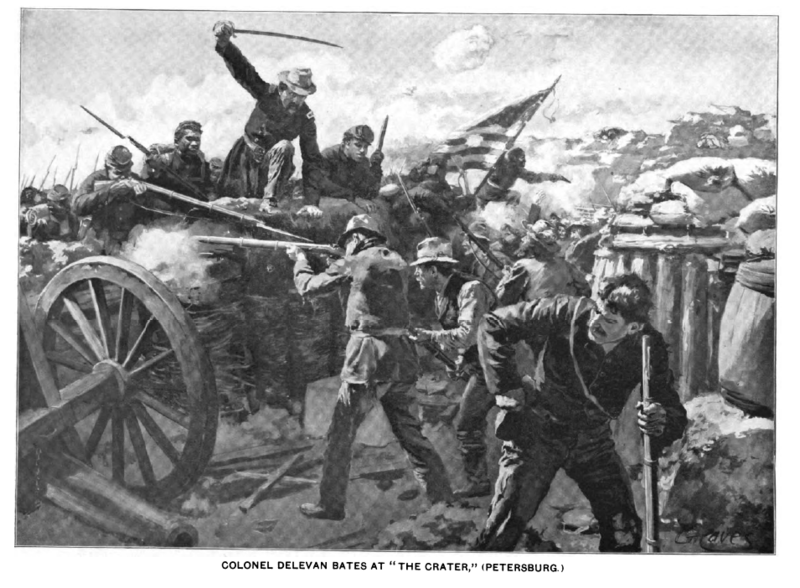 National Tribune: For a Union veteran counterpart to the Southern Historical Society Papers, check out articles from the National Tribune, a postwar Union veterans newspaper filled with first person accounts from the Siege of Petersburg. Letters & Diaries: There are thousands of soldier accounts of the Siege of Petersburg written in their own hand. I have a very modest but always growing collection of letters and diaries from men who fought at the Siege of Petersburg. If you know of any others I might be able to use, please Contact me. For more great information, just left click on the Resources tab at the upper left hand corner of each and every page on the site. We are always looking for submissions of information pertaining to the Siege of Petersburg. If you are a student of the Petersburg Campaign, please consider contributing as an author here. Use the Contact form at the top of the page if you have information we can use or if you are interested in writing here at The Siege of Petersburg Online. We Need YOU to Contribute Siege of Petersburg Materials! Note: If you currently have primary source materials of soldiers who fought in the Siege of Petersburg, we would like to feature those materials at Beyond the Crater. Don’t be shy! Many descendants of soldiers who fought around Richmond and Petersburg in 1864-65 have already contributed meaningful materials already published on this site. Please use the Contact form at the top of the screen to let us know about any materials you would be willing to share. Proper attribution and copyright protection will always be strictly enforced. Your materials WILL make The Siege of Petersburg Online a more useful resource for all students of the Civil War.